I visited Jungle Jim’s Playcentre recently with a friend and our kids (between us we have seven kids, aged 2 months to 6 years). 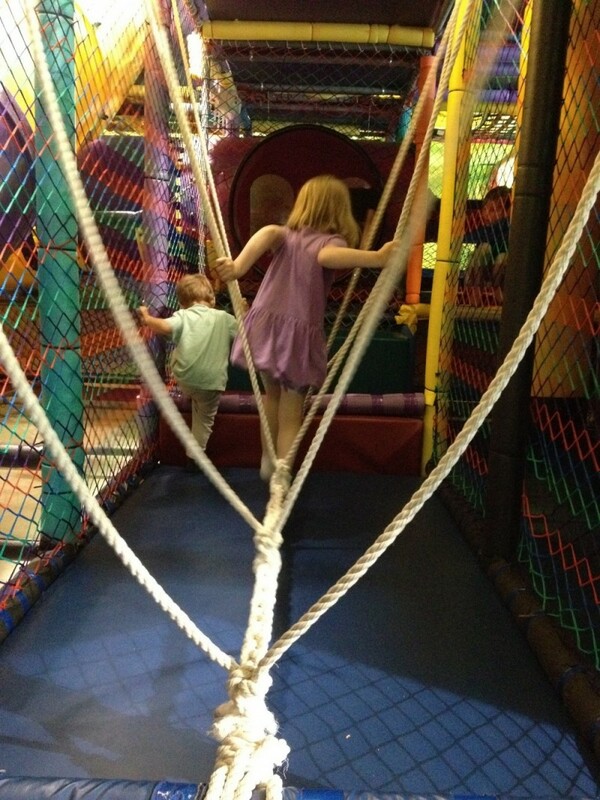 I was pleasantly surprised at what a great indoor playground Jungle Jim’s is and how much fun we all had. Even though it’s a small space, the kids didn’t run out of things to do and still didn’t want to leave after two hours of playing. Admission Cost: $10 for kids ages 4 and up, $5 for kids ages 3 and under. All paid admission includes a drink and popcorn. Footwear: Socks are required, but are available for purchase if you forget. Food Services: A snack bar includes lunch items such as homemade pizza, hot dogs, chicken nuggets, sandwich wraps, and drinks. A hot dog is $1.50, and drinks are $1.00. Space: They’ve made great use of the small space they have. The climbing structure is not very big but it is tall and there is no shortage of things for kids to climb. There are two big tunnel slides (one of which is extremely fast), a few climbing tunnels, rollers, and low ropes to walk on. There is a Foosball table, air hockey, free arcade games, and a skee ball game that all the kids loved. There is a little area for infants/toddlers tucked away underneath the climbing structure with some toys (that get cleaned regularly), rocking chairs and a t.v. (which was playing Frozen while we were there). The two year olds had a hard time climbing up the equipment without any help but the older kids were more than happy to help them. And they loved the slides as much as the older kids. Even us adults got in on the action, climbing to the top and going down the really fast slide. It was terrifying but thrilling and we had just as much fun as the kids. The sitting area for adults was also small but comfortable. There are two leather couches in front of the climbing structure. Even though you can’t see the whole climbing structure from the seating area because some areas are hidden, the climbing structure is very contained with only one entrance right by the seating area, so you wouldn’t be able to miss your kids going in or out of the climbing area. The eating area is fairly large and very clean. There are cameras on the climbing structure that you can watch from the eating area, so you are able always able to see your kids. There is also a tv with child-friendly shows and movies playing. The kids had their complimentary drink and popcorn in between playing and we all had some of the homemade pizza for dinner, which was delicious. Service: The owner, Roger, was extremely accommodating, even opening up Jungle Jim’s for us when it would normally be closed. Although he mostly caters to birthday parties right now, he is open to the public Tuesdays and Fridays 11am-8pm and is hoping to have more hours soon. But he is more than willing to open any time for groups or events. We said we would love to set up a playdate at Jungle Jim’s soon and he said to just let him know a time and he would open it up for us. The Jungle Jim’s Playcentre birthday party packages are very reasonable and can include invitations, food, cake and loot bags, making it a very easy option as well! Overall: If you have babies and are looking to have a coffee with a friend, this may not be the best place to go. Otherwise, Jungle Jim’s is a great indoor playground. We had such a fun time at Jungle Jim’s and my kids keep asking when we can go back. We will for sure be returning very soon.